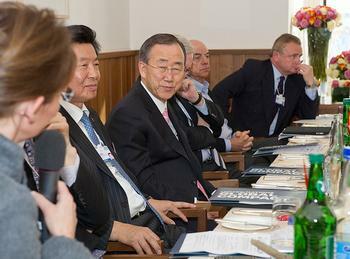 DAVOS, Switzerland, January 28, 2011 (ENS) – “Revolutionary action” is needed to achieve sustainable development, UN Secretary-General Ban Ki-moon today told the government and business leaders at World Economic Forum in Davos. The UN chief issued an urgent warning that the past century’s heedless consumption of resources is “a global suicide pact” and time is running out to ensure an economic model for survival. It is time to secure the balanced development that will lift people out of poverty while protecting the planet and ecosystems that support economic growth, he told heads of state and government, international economists, business and industry leaders and civil society. Sustainable development is the right growth agenda for the 21st century, said Ban, recounting the mistakes of the past century based on a false belief in the infinite abundance of natural resources. “It is easy to mouth the words ‘sustainable development,’ but to make it happen we have to be prepared to make major changes – in our lifestyles, our economic models, our social organization, and our political life,” he urged. “We have to connect the dots between climate change and what I might call here, WEF – water, energy and food,” Ban said, echoing the acronym for the World Economic Forum. He called on business leaders present to join the 11-year-old United Nations Global Compact, the world’s largest corporate responsibility initiative committing businesses to aligning their operations and strategies with 10 universally accepted principles in the areas of environment, human rights, labor and anti-corruption. At a separate event in Davos, Ban launched a new Global Compact initiative called Global Compact LEAD with a group of 54 global companies, labor business and civil society organizations as founding members, who have committed to be at the cutting edge of environmental, social and governance issues, joining forces to translate sustainable development principles into business operations and deepening partnerships with the entire UN system. Board members include executives of Fuji Xerox, Japan; Beijing Rong Zhi Institute of Corporate Social Responsibility, China; Petrobras, Brazil; Bank of America, United States; Areva, France; Grupo Aeroportuario del Sureste, Mexico; Deloitte, South Africa; Tata Sons Limited, India; SK Group, South Korea; Emirates Environmental Group; International Chamber of Commerce; and the International Trade Union Confederation. “When companies like yours drive sustainability issues deeper into your operations and strategy, year after year, you send a powerful signal. 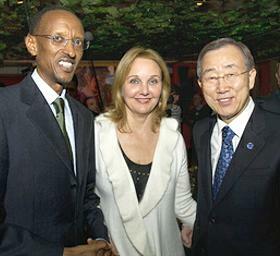 Indeed, you change the world,” Ban told the Global Compact LEAD meeting today. “In this century far more than the last, we need business to achieve our fundamental purposes at the United Nations. Speaking at a news conference, Ban said that much of his time in Davos has been spent building momentum to deal with climate change, stressing that agreement among all nations is both necessary and possible. “It may not be easy, but things worth doing seldom are,” he said. UN-sponsored conferences in Copenhagen, Denmark, and Cancun, Mexico, over the past 13 months have narrowed some differences including pledges to help developing countries mitigate the effects of climate change and action to tackle deforestation, which accounts for nearly one-fifth of global warming carbon emissions. But the major components of an accord to cap the increase in the world’s average temperature at two degrees Celsius above pre-industrial levels still remain unresolved. Leaders at the World Economic Forum are embracing the new perspective of the Global Adaptation Institute that puts “adaptation” at the center of world climate policy, says the institute’s CEO, Dr. Juan Jose Daboub, a former managing director of the World Bank. “Some of the world’s most prominent private sector leaders have told me privately – and all conversations at Davos are private – that they are ‘stunned’ by the speed with which a change is taking place on the climate issue, toward adaptation, and they are rushing to re-examine how their businesses will approach climate change, both in terms of corporate social responsibility efforts and as a bottom-line, profit and loss factor for their enterprises,” Daboub said. In a taped audio speech from Burma, also called Myanmar, she called for environmental responsibility, saying, “I would like to request those who have invested or who are thinking of investing in Burma to put a premium on respect for the law, on environmental and social factors, on the rights of workers, on job creation and on the promotion of technological skills. In the 1990 general election, Suu Kyi’s National League for Democracy party won 59 percent of the national votes and 392 of 485 of the seats in Parliament. But she had been detained under house arrest before the elections. She remained under house arrest for almost 15 of the 21 years from July 20, 1989 until her release on November 13, 2010. The North Caucasus Resorts Company, NCRC, the newly-incorporated state enterprise charged by the Russian government with implementing a $15 billion program called Peak 5642 to develop mountain resorts in the Caucasus, presented the first phase of its plans to investors at Davos. In 2014, Russia will host the Olympic Winter Games at Sochi in the Caucasus mountains near the Black Sea. To capitalize on this event, the government plans massive development of the region. The NCRC has been given a target of five million visitors a year to the region by 2020, up from one million currently. Five new resorts will accommodate up to 150,000 people a day, with hotel rooms for 90,000 people are supposed to be ready to receive first visitors as early as 2014. 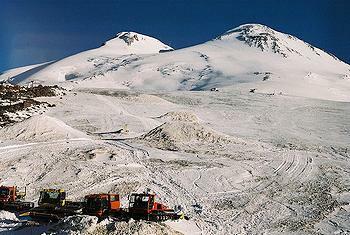 On of the resorts is planned for Mount Elbrus, the tallest mountain in Europe, where the second highest ski resort in the world will be constructed. In Davos, Akhmed Bilalov, vice-president of the Russian Olympic Committee, who has been appointed chairman of the NCRC Board, said he is seeking partners in environmental sustainability as well as investment banking, auditing, global marketing, infrastructure and public transportation. They presented the UNEP team with a bottle of filthy water from the Dzykhra River, which runs through Sochi National Park. The river was polluted earlier this month by a mudslide from an illegal dump used to pile construction waste from an Olympic road being built through the park.